This article is about the fictional character. For the similarly named musician, see Ben Riley. For the similarly named British politician, see Ben Riley (politician). Benjamin "Ben" Reilly (/ˈraɪli/), also known as Scarlet Spider, is a fictional superhero appearing in American comic books published by Marvel Comics. He is a clone and ally of the original Spider-Man (Peter Parker) and is prominent in the 1994–96 "Clone Saga" storyline, which led to his murder by the Green Goblin (Norman Osborn). Created by writer Gerry Conway, the character first appeared in The Amazing Spider-Man #149 (October 1975). During the "Clone Saga" storyline, he came to wear a makeshift costume similar to Spider-Man's consisting of a blue sleeveless hoodie sweatshirt adorned with black motifs of a spider on its front and back, over a red spandex bodysuit and mask, with utility belts and wrist-worn sizable web-shooters that were designed by artist Tom Lyle, before donning a variation of Spider-Man's costume designed by artist Mark Bagley as his successor for some time before his death. In 2017's "Dead No More: The Clone Conspiracy" story arc, the character was resurrected. In the 2017 series Ben Reilly: The Scarlet Spider, he reclaims his Scarlet Spider identity and reimagined by Marvel Comics' creative teams as an antihero, starting a spiritual quest to redeem himself as a true hero once more and has completed it in another arc "Spider-Geddon", again serving as Spider-Man's heroic ally. 2.6 "Dead No More: The Clone Conspiracy"
One of the things I was trying to do at that time was take ideas to their logical, yet absurd conclusion, reductio ad absurdum. The idea was that if we have Gwen Stacy brought back as a clone, how can I up the stakes when I get rid of her? When I write her out of the book, what can I do to make that really effective and to punctuate it, to bring it to the next level? And I thought, if we can clone Gwen, we can certainly clone Peter. I was also at that time enamored with titles that played off of old, melodramatic Stan Lee titles of the past. ... I came up with the title, "If I Kill Me, Will I Die? "[a] It was basically a parody of an old overdramatic Stan Lee title, but I also thought it was a good title in general. So that's really what the impetus was - to raise the stakes, give us a good finish to the Gwen Stacy saga, and to allow me to have a little fun with the storytelling conventions of the time. Though Conway had no intention of using the character beyond this initial appearance, in which he dies, Reilly returned to the comics during the "Clone Saga", which ran from October 1994 to December 1996 through all five of the concurrent Spider-Man titles — The Amazing Spider-Man, Web of Spider-Man, Spider-Man, Spider-Man Unlimited, and The Spectacular Spider-Man. Editor Danny Fingeroth directed the Spider-Man artists to design a costume for the character which would stand out from conventional superhero costumes by emphasizing simple functionality rather than flash. The artists worked on costume ideas independently, and according to Mark Bagley, Tom Lyle's "hoodie" design won unanimous approval among them. The original costume was later replaced by an updated Spider-Man costume designed by Bagley with minor alterations by Bob Budiansky. Between November and December 1995, Scarlet Spider replaced Spider-Man in all five of the comics' titles, which became The Amazing Scarlet Spider, Web of Scarlet Spider, Scarlet Spider, Scarlet-Spider Unlimited, and The Spectacular Scarlet Spider. Reilly was also featured prominently in the supplemental material provided for the storyline, including Spider-Man: The Lost Years and Spider-Man: Clone Journals. The storyline was later revisited in What If vol. 2 #86. Reilly was passed the mantle of Spider-Man and was featured throughout the Spider-Man titles The Amazing Spider-Man, The Spectacular Spider-Man, Spider-Man, Spider-Man Unlimited, and The Sensational Spider-Man, which replaced Web of Spider-Man as an ongoing monthly title. Reilly remained as the featured Spider-Man between January and December 1996. During this period, the character was also featured in two intercompany crossovers DC vs. Marvel with DC Comics and Backlash/Spider-Man with Image Comics. Though the character has not been used in mainstream continuity since his death in Spider-Man #75, the character is often alluded to and provided the foundation to the backstory in the Spider-Girl mythology. In January 2009, Reilly returned to comics as Spider-Man in the third part of Marvel's X-Men/Spider-Man miniseries. Written by Christos Gage, the series explores episodes in the histories of both the X-Men and Spider-Man, sticking thoroughly to the source material of the timeframes the stories take place in. Issue #3 marked the first new adventure featuring Reilly in more than twelve years. Starting in 2009, and continuing into 2010, Marvel published a six-issue mini-series titled Spider-Man: The Clone Saga that was a retelling of the story as it had originally been envisioned. In 2010 Marvel began collecting the story in trade paperback and hardcover forms (ISBN 978-0785148050). The epic spans five books and covers Reilly's time on the road, through his encounters with Peter and Mary Jane, up to his role as the Scarlet Spider, as the lone spider hero in New York. On July 25, 2010, at the San Diego Comic-con, fans expressed their desire to see a return of Ben Reilly. To this, assistant editor Tom Brennan replied, "It's being worked on." During San Diego Comic Con 2011, a teaser image was posted on Marvel.com of Reilly's shirt in flames, entitled "The return of The Scarlet Spider?" It is revealed in The Amazing Spider-Man #673 and the Marvel Point One one-shot that Kaine will be the new Scarlet Spider in his own ongoing series, which was confirmed by editor Steve Wacker in the "Letters to the Editor" page of #673. Later, Ben Reilly in his Scarlet Spider uniform appears to be fighting Kaine on the cover of Scarlet Spider issue #21. At the climax of the issue it is revealed that this is Kraven the Hunter impersonating Reilly. Ben Reilly is resurrected in the storyline "Dead No More: The Clone Conspiracy", where it was revealed that his remains had been retrieved by the Jackal after his death, the Jackal spending several months 'killing' Ben and bringing him back to life to try and perfect a new cloning process. Ben eventually managed to escape the Jackal's control, but was so broken by the experience of multiple deaths that he took control of the Jackal's scheme, even adopting the Jackal name for himself, and set out to bring several of Peter's deceased allies and enemies back to life, using a flawed cloning process that required the resurrected to ingest a pill on a daily basis to stay alive. After a final confrontation with Peter forced him to face how far he had fallen when he tried to 'kill' all of humanity and bring them back as 'immortal' clones, Ben fakes his death and relocates to Las Vegas to try and re-learn how to be a hero, returned to the Scarlet Spider identity. Ben Reilly was created by the Jackal (Professor Miles Warren), and was the first successful clone of Peter Parker; a previous clone suffered from clone degeneration and was considered unstable. Through arcane science, Reilly is imprinted with a copy of Parker's memories and in their first encounter believed himself to be Parker. After Parker was captured by Jackal, both Parker and Reilly found themselves in Spider-Man costumes at Shea Stadium, and initially fought each other believing the other was the impostor. When realizing the stakes, they decided to team up in an attempt to save the Gwen Stacy clone and a captured Ned Leeds. In the process, Reilly appeared to be killed in an explosion, and Parker, fearful of the consequences of a corpse of a second Peter Parker being found, dropped Reilly's body into a smokestack. Reilly survived and escaped from the smokestack. When he witnessed Parker and Mary Jane Watson in an embrace, Ben, despite acknowledging that he is a clone, also accepted Parker's strong sense of morality as his own. He refuses to succumb to the temptation of murdering his doppelgänger, chooses to be a decent man, and decided to embark on a nomadic life. He dubbed himself "Ben Reilly", using his uncle's first name and his aunt's maiden name (Ben Parker and May Reilly respectively). He took some old clothes Parker had intended to donate to charity, and he left New York deeply depressed but also inspired by his own advice to build a life of his own. Stricken with influenza, Ben Reilly meets Seward Trainer, a scientist who was secretly blackmailed by agents of Norman Osborn into keeping track of him. Trainer helps Reilly re-establish his life, and Reilly sees Trainer as a father figure. Reilly trusts Trainer completely because he helps Reilly survive his aimless wanderings, provides Reilly with forged credentials allowing him to find work for a few months at a time. Ben subsequently moves on just before people can examine the references closely enough to learn that they are faked, using the money earned to fund himself until he next needs work. During this time, Reilly is hunted by Kaine, a failed clone of Peter Parker. Kaine believed Reilly to be the original Peter Parker and hates him for being flawless, although initially Kaine is unsure why he is stalking Reilly other than wanting to see him suffer. Reilly finds love with college student/waitress Janine Godbe, but she later reveals that her true identity is Elizabeth Tyne, a fugitive who killed her father after enduring his repeating incestuous abuse. Although he spends some time living with Janine, she apparently commits suicide out of guilt at her past crimes, leaving Reilly to be constantly followed by Kaine vowing to deny Reilly happiness for as long as he can. Besides fighting Kaine, Reilly sporadically engages in heroics; although he dislikes playing the hero as it reminds him of life as Peter Parker, he finds himself unable to ignore his spider-sense when it goes off with sufficient intensity, also acting as a short-term vigilante to dismantle a major drugs cartel in Salt Lake City during his third year. During a particularly bleak period, Reilly works in dead-end jobs and allows himself to be regarded as mentally handicapped rather than interact with others. After his spider-sense prompts him to save a family from being killed during a robbery, he accepts that he cannot give in to despair and must try to make a difference when he can. Following this, he lives for a short time in Italy and works as an English teacher, but is forced to leave after a Mafia boss investigates Reilly's past when his daughter expresses an interest in Reilly. The Mafioso learns about the gaps in Reilly's work record and forced him to leave the city. While traveling, Reilly fights the mystical villain D'Spayre and a psychopathic showman named Wild-Whip. [volume & issue needed] One experience during this time of his life saw Reilly hired as the assistant of scientist Damon Ryder, but Ryder's experiments with dinosaur DNA saw Ryder mutate himself into a man/dinosaur hybrid, with a later attack by Kaine starting a fire that killed Ryder's family, forcing Ben to flee. Ben Reilly as Spider-Man, wearing the costume designed by Mark Bagley. Art by Dan Jurgens and Klaus Janson. Ben Reilly later becomes the replacement version of Spider-Man for a time when Peter Parker retires to raise his unborn child. Reilly wears his own costume style rather than Parker's. Meanwhile, both men are misled by the Jackal and Seward Trainer, working under orders from Norman Osborn, into believing that Reilly is the original and Parker is the clone. Osborn hopes that the revelation that his life was a lie would make Parker give up; instead both Parker and Reilly see this as a chance to start again. Reilly starts working at a diner called the Daily Grind. He also dyes his hair blond to differentiate himself from Parker. Reilly works there for a year, battling villains. The change in costume initially prompts the Daily Bugle to claim there is a new Spider-Man, but Reilly and Mary Jane Watson throw them off the scent and the story is dropped. Only the Black Cat, Venom, Silver Sable, Sandman, the Human Torch, and his former teammate Firestar ever learn that they are dealing with a different Spider-Man, although Reilly also tells Daredevil the truth, and Mysterio concludes that there had been a substitution when studying newspapers after being released from prison. The X-Men — specifically Cyclops, Storm, Angel, Iceman, and Wolverine — also know the truth because Reilly told them why he was unaware of an earlier team-up involving Peter helping the X-Men trace Mister Sinister's activities. Ben Reilly as Spider-Carnage, from The Amazing Spider-Man #410. Cover art by Mark Bagley. During the "Web of Carnage" arc, Ben Reilly is bonded with the Carnage symbiote when it escapes from Ravencroft Institute, where its psychopathic host Cletus Kasady is being held. Unlike his experience with the Venom symbiote, Reilly struggles for control of himself, and he attempts to trap it inside of him. He has John Jameson take him to a cell designed to hold Carnage and subjects himself to a potentially fatal dose of microwave radiation to try to kill the symbiote, which returns to Kasady via the pipes. Seward Trainer disappears while Ben fights with the Carnage symbiote. Reilly's bank account is frozen and his possessions stolen while the Grind is burned down and Reilly is framed for arson. Parker helps Reilly fend off Gaunt's latest attack after his real identity was uncovered. Reilly is attacked by Norman Osborn while his spider-sense is disabled by a gas Gaunt used. Osborn reveals Reilly is the clone, beats him unconscious, and takes him and Parker to his base opposite the Daily Bugle offices. Osborn intends to blow up the building, with most of Parker and Reilly's friends inside it after they were sent false invitations. While Parker battles Osborn, Reilly attempts to evacuate the Daily Bugle, but injures himself further while protecting Flash Thompson from a bomb. While helping Parker to remove the remaining bombs, Reilly intercepts a Goblin Glider before it can impale Parker. Reilly falls several stories and crashes onto a taxi underneath. As he lies dying, Reilly tells Parker that he will have to resume the role of Spider-Man. Reilly dies and his body decomposes rapidly, confirming that he was actually a clone. This sacrifice, and concurrent still-birth of his child, leads Parker to reclaim the Spider-Man identity. During the 1998 "Spider-Man: Identity Crisis" storyline, when Spider-Man adopts four new identities to continue to act as a hero after Norman Osborn put a bounty on him, his weapons as the Hornet include an adaptation of Ben's old sedative stingers, and later used by Spider-Man's successor of the identity, Eddie McDonough. Later, in the aftermath of the story, Spider-Man used Ben's web-shooters so that he can use his impact webbing and stingers. During the 2006 "Civil War" storyline, he uses the pseudonym Ben Reilly and a holographic disguise device given to him by Beast. While on a mission to remove Spider-Man's powers, the Initiative employs three "Spider-Men" to aid in the capture of the Sinister Syndicate. They are called Scarlet Spiders by War Machine. One of the people Mister Hyde gives Spider-Man's powers to appears in a costume that Ben Reilly wore as the Scarlet Spider in a jail cell. Damon Ryder, using the alias "Raptor", later attacks Parker, mistaking him for Reilly. Ryder blames Reilly for the accidental death of his family, his mind warped by his mutation, but Spider-Man is able to defeat Ryder. "Dead No More: The Clone Conspiracy"
Ben Reilly appears as part of the 2015 All-New, All-Different Marvel branding, in the form of the mysterious man in a brilliant red suit with an Anubis mask, that everybody believes to be Miles Warren. After his death at the hands of the Green Goblin, Jackal collects Ben's dissolved remains and clones him. However, Jackal finds problems with the cellular degradation. He has Ben killed 26 more times, all of which have Ben's life (and most of Peter's) flash before his eyes. In the process, Ben's benevolent nature are repressed, becomes morally ambiguous, and mentally unbalanced resulted by his deathly ordeals. Ben eventually breaks free and knocks out Jackal. After he improves Warren's formula, he makes clones of Miles Warren and brainwashes Jackal that he is a clone, making it nearly impossible to tell who is the real one. Now free with a number of Miles Warren clones with the original as his servants, Ben becomes the new Jackal and is determined to repay the people who have influenced his and Peter's lives with Jackal's technology to make sure no one has to suffer again and those who have can become whole. Ben approaches several of Spider-Man's enemies with a chance to revive their lost loved ones if they follow his orders. The revived ones are cloned by Jackal. Jackal has New U Technologies obtain the bodies of Doctor Octopus, Alistaire Smythe, and other villains for his "Reanimations." When the Doctor Octopus-possessed Octobot orchestrated the reanimation of Doctor Octopus' body, Doctor Octopus disposed of the Peter Parker conscious and took control of the body while emerging from the vat. Jackal gives Doctor Octopus his tentacle pack and some New U Pills that would help prevent any clone degeneration. Spider-Man infiltrates New U Technologies and chases after Jackal. Following Jackal into a room, Spider-Man is caught by surprise by Gwen Stacy and then ensnared by Doctor Octopus. After the Jackal breaks up the fight between Spider-Man and Doctor Octopus, he shows Spider-Man around the New U Technologies. After Spider-Man is rescued by Kaine and Spider-Woman of Earth-65, he is told that they visited unidentified alternate Earths where the collaboration of Parker Industries and New U Technologies resulted in humanity suffering a zombie apocalypse at the hands of the Carrion Virus. Ben finally reveals himself to Peter and offers him the chance to bring back "their" Uncle Ben. Ben tells Peter that even if Peter doesn't feel like he deserves to have his loved ones brought back, most of them deserve a second chance at life. After hearing Ben's story and proposal, Peter becomes more interested. Ben starts driving Spider-Man to the New U Technologies facility with Uncle Ben's corpse and explains to Peter that he made his company and vision come to life through emotionally blackmailing the higher-ups of society. He shows Peter the "Haven," a section of the facility set up like a normal neighborhood where Peter sees all of his resurrected friends and enemies. He tells Ben that the reason he hasn't brought Uncle Ben back yet is because Uncle Ben would tell him that he's wrong and that he's using this power without responsibility. Jackal orders Spider-Man's enemies to kill him. Anna Maria reveals she knows how to stop the decaying process on the clones and Jackal offers her the "Proto Clone" body in exchange for the formula. Doctor Octopus takes offense to Jackal's comments on Maria's dwarfism and attacks his boss. When Doctor Octopus activates the Carrion Virus, it starts spreading which causes Anna to also be affected. Jackal takes over J. Jonah's broadcast to tell the world that they will all die and be reborn. During the fight, Ben knocks Kaine out of the facility. Doctor Octopus fights Jackal to allow Peter and Anna Maria the time to transmit the frequency. When Spider-Man sends out a signal that prevents the clones from decaying, the clones of Ben Reilly, Doctor Octopus, and Gwen Stacy are seemingly reduced to dust. It is revealed during the fight that Doctor Octopus implanted his mind into the Proto Clone and Ben Reilly saved himself using New U Pills and Webware Technology. He returns to his safehouse (designed after Peter's childhood home) only to find the true Miles Warren back as the Jackal. Jackal burns down Ben's safehouse before Ben defeats Jackal in a fight, leaving the mad scientist to supposedly die in the fire in the process. Ben swings off pondering what he's going to do with his life. While unwinding at a bar Dr. Rita Clarkson is met by a disguised and disfigured Ben Reilly. Though Rita regrets what New U Technologies did, Ben still believes they were doing good for the people. He asks Rita for a loan, but she refuses until Ben saves her from some criminals who tried to kill her for New U Technologies' actions. She gives Ben a kiss before he heads off toward Broadway. Relocating to Las Vegas, Ben steals a variant Spider-Man outfit similar to Spidercide's from a cosplayer and starts to act as a hero once again, albeit making those he saves pay him for his assistance in return, while trying to make a discreet civilian life for himself. When one of his former New U Technologies clients named Cassandra Mercury threatens him to try and cure her daughter Abigail of a debilitating disease, Ben agrees to the offer in exchange for a lab and other resources. He adopts a perfect replica of his original Scarlet Spider outfit when a trio of 'fans' of Spider-Man break into the casino to try and confront a gangster only for their would-be target to break the neck of the one in the traditional Spider-Man outfit. Ben tells the two survivors to depart after introducing himself and takes the costume from the other "Scarlet Spider." He's then confronted by Kaine Parker, who was looking for him in San Francisco. After an argument at Ben's hotel room, they begin to fight. Ben convinces Kaine to stand down by arguing that he is genuinely trying to cure Abigail Mercury's terminal condition, but Kaine makes it clear to Ben that he will kill his "brother" for protecting the world if Abigail dies and once Ben has saved her life. After Abigail Mercury dies because Ben tested a new drug on her too quickly, he is attacked by Kaine once again, only for Kaine to be "killed" by what appears to be Marlo Chandler. Though the Marlo Chandler look-a-like quickly identifies herself as actually being Death, using Marlo's form to communicate. She explains that she has an "interest" in Ben as no other person has been brought back to life so often. Death reveals that he has "died" so many times that his soul has become corrupted and if he undergoes one more resurrection, he will likely suffer so much spiritual damage that his soul will be broken for good. She offers Ben the chance to restore the girl or Kaine to life before she departs. When Ben asks her to save both of them and kill him instead, Death not only heals the other two, but also restores Ben's vitality and appearance. Death also affirms that he has made a start on his efforts to redeem himself of his sins as the Jackal and become a superhero once more. However, after a confrontation with the newly-reformed Slingers saw Ben brutally attack a man for his apparent role in thefts of food from Ben's current employer, Ben learned that his new appearance will scar if he does anything to compromise his status as a hero, leaving him with a disfiguring scar around his right eye as he is faced with an order from the Slingers to surrender himself to the police for the beating. Confronting the Slingers, Ben learns that the new Hornet is actually Cyber, who was brought back to life by a demon possessing the Black Marvel, prompting Reilly to join forces with Kaine and the other Slingers to defeat the two. Reilly is nearly drowned by the Black Marvel, but Kaine is able to find a priest to bless the fountain and allow Reilly to destroy the demon. The Slingers forgive Reilly's earlier beating, acknowledging that there are shades of grey that they should recognize. Dusk passes on a warning to Reilly about Mysterio, but when Ben visits the ex-villain, Beck's story about his decision to retire after the time he died and went to Hell prompts Reilly to accept Beck's desire to move on from his past due to his own efforts to move on from past sins. Ben subsequently assists Doctor Strange and various other heroes in thwarting Mephisto's attempt to take the souls of several Las Vegas residents and guests to Hell, but in response, Mephisto creates a complex deception that stops Ben from saving Abigail in the belief that his 'cure' would condemn her to an immortal existence at her current age, subsequently altering Kaine and Cassandra's memories so that they will try to kill Ben in the belief that he withheld the cure for his own profit. Although Ben is killed by Kaine just as the hour runs out, his spirit is saved by Abigail as she ascends to an angelic level of existence thanks to his cure. Abigail rewards Ben for all of his sacrifices by offering to give him his life back, but Ben refuses, remembering Death's words that his soul would be shattered if he came back to life one more time. Nevertheless, Abigail does it anyway. Escaping from the body bag and ambulance he was in, Ben is confronted by Mysterio's daughter, Misty. Ready for revenge, she's ready to attack when Ben, not caring one bit, simply punches a hole through her stomach hard enough to kill her only to discover that she was actually an android. He soon afterwards confronts and stabs Kaine several times, threatening him to get out of Vegas if he lives through this and then disappears to a rooftop, where he began laughing and sobbing in the rain. During the "Spider-Geddon" storyline, Superior Octopus becomes Superior Spider-Man again and recruits Kaine to help fight the Inheritors. When Kaine suggests that they enlist Ben Reilly as well, Superior Spider-Man states that the Inheritors are going to use technology from the defunct New U Technologies to rebuild their cloning machine. Kaine sees their point and both of them enter a portal. Overhearing what the Inheritors plan to do with his technology, Ben secretly follows Superior Spider-Man and Kaine into the portal and volunteered his services - wanting to take responsibility for his villainous actions. Otto initially refused, still holding a grudge over Ben's deception as the Jackal, but Ben explained that having been killed and resurrected so many times had driven him insane and that he was trying to redeem himself, something that Otto should be able to identify with. Otto begrudgingly allowed Ben to join the team, but after Spider-Noir/Spider-Norman and Spiders-Man sundered Earth-616's connection to the Web of Life and Destiny, Otto seemingly betrayed Ben, giving him to he Inheritors in exchange for the other Spiders being left alone. Ben was killed once again when Jennix consumed him which in the process drove the Inheritor insane when he was forced to relive the memories of Ben's 29 deaths and resurrections. Ben was resurrected a 30th time by Otto, who revealed he and Ben had planned for this to happen and Ben stated it had given him a clean slate, most likely returning him to the hero he was before owing to he died nobly. However, because of Ben's previous actions as the Jackal, Peter again distrusts him and thus Ben once more tries to earn Peter his trust. As Spider-Man's clone, Ben Reilly possesses proportionate spider-like abilities and traits identical to Peter Parker's, including superhuman strength, speed, reflexes, stamina, durability and agility, along with the ability to crawl almost any surface. He also has a precognitive "spider-sense" that warns him of danger. Reilly's reflexes and stamina operate up to 40 times faster than those of a normal person, while his strength allows him to lift 150 times his own weight (around 10-15 tons), although he has lifted much more. Because Reilly was not in the role of Spider-Man for five years while traveling, his fighting style is less polished than that of Parker's. However, Kaine noted that Reilly is a calculating and cunning combatant, able to strategically defeat powerful opponents such as Venom, and thus he is more reliant on his tactics rather than skills. He possesses Peter Parker's genius-level scientific intellect, and occasionally surpasses Parker in ingenuity of their shared expertise in the fields of applied science, chemistry, physics, biology, engineering, mathematics, and mechanics. Like Parker, Reilly is committed to better himself intellectually; he, with Dr. Seward Trainer's mentorship, taught himself further in these disciplines and is a skilled scientist and inventor on par with Parker's scientific trainings despite not receiving a formal education. After enduring years of hardships, he develops a strong will powerful enough to not be overwhelmed by either Venom nor Carnage symbiotes' possession. While acting as the Jackal, Ben wears a scarlet business suit and an Egyptian-style Anubis mask. Like Kaine, that being a clone of Spider-Man, Reilly is immune to the worldwide mind purging of Spider-Man's identity and retains this knowledge. After relocating to Las Vegas, Ben steals a Spider-Man-themed costume similar to another clone Spidercide's from a cosplayer, consisting of mostly red with a dark blue triangle on the chest and a red spider-emblem, along with a blue hood over a red mask. In his civilian identity, he initially wears a hoodie and large sunglasses to conceal the scarring caused by the flawed cloning process, before Death restores his health and appearance. He would later forcefully take a replica of his Scarlet Spider costume from a would-be "real-life superhero" after getting criticized over the first costume he stole, and also recreated his web-shooters. As a result of his resurrection by Death, Ben was cured of the scars left by the cloning process that brought him back to life, but has learned that these scars will return to varying degrees if he compromises his heroic status, such as an assault on a civilian who had committed robberies leaving Ben with new scarring around his right eye. In the alternate future known as MC2, Ben Reilly's "niece" May Parker (Spider-Girl) wears his version of the Spider-Man costume and webshooters, having been raised on tales of her heroic "Uncle Ben". Like her father, May has an Uncle Ben. However, May never knew her uncle. Reilly's last words before his death are about her: "Take care of my niece, Peter ... tell her about ... her Uncle Ben." May Parker keeps Reilly's costume and webshooters in storage since his death, and uses them herself. When May asks her father about Reilly, however, Parker does not tell her that Reilly was a clone, but tells her that he was a cousin. Ben Reilly had a son by Janine Godbe (Elizabeth Tyne), named Reilly Tyne, who becomes a superhero called Darkdevil. Kaine's efforts to save his "nephew" from cellular degeneration resulted in him being partly possessed by the demon Zarathos and the spirit of the deceased Matt Murdock. Later in the series, Kaine reformed. Felicity Hardy, the daughter of Felicia Hardy (Black Cat), assumes the Scarlet Spider identity in an attempt to become partners with Spider-Girl. Peter Parker is angry at what he considers an inappropriate use of the identity. The Ultimate Marvel version of Ben Reilly is an African-American scientist who worked with Dr. Curt Conners at Empire State University. He combines a sample of Spider-Man's DNA with Lizard's and the Venom symbiote to create the Carnage organism, and steals a second sample of Spider-Man's DNA from the lab. Reilly later works with Doctor Octopus, creating five clones of Spider-Man while employed by the CIA. One clone has Kaine's insane personality and facial scars and wears a makeshift version of Ben Reilly's costume. What If? #30, "What If Spider-Man's Clone Had Lived? ", depicts a world where, after the Jackal's bomb explodes at Shea Stadium, both Spider-Men are knocked unconscious and the clone awakens before the original. The clone, believing that he is the original Peter Parker, puts Parker into stasis in one of the Jackal's clone-growing devices and attempts to continue with life as normal. However, the clone has no memories from the time before the cell samples he had been grown from were taken, and is confused and lost in the world of the real Peter Parker. This memory gap and the discovery of the Jackal's notes on his cloning process, leads the clone to realize what he truly is, and he frees the real Parker just in time for both of them to confront a threat from the Kingpin. Afterwards, the clone prepares to leave to seek his own fortune, but accepts an offer from Parker to co-operate in "shifts", switching between being Parker and Spider-Man. In this story, the clone never establishes a separate name for himself, and is referred to as "Spider-Clone", "brother", or "bro" by the original Parker. What If? vol. 2 #86, "What If Scarlet Spider Killed Spider-Man? ", gives an alternate ending of the "Clone Saga". During the time Spider-Man is under the Jackal's control, the Scarlet Spider and Spider-Man fight until there is an explosion. Reilly's body is later found washed ashore and Peter Parker is believed to be dead. Reilly awakens in hospital and finds Parker's friends and family, who believe he is Parker, around his bed. The following year, Reilly and Mary Jane discover that their baby, May, is dying of blood poisoning. One night, Reilly wakes to find that May has been kidnapped. Ben searches for her and meets the Green Goblin, who reveals that he is behind the "Clone Saga" and needs May's blood for a serum. The two fight atop the George Washington Bridge, where Gwen Stacy was killed. During the struggle, they both fall into the river below. Reilly resurfaces with the Goblin's mask and the serum and is met by Mary Jane. Reilly discovers that she knows that his true identity is Ben Reilly. Mary Jane thanks Reilly and tells him to find his own identity. Spider-Man: Life Story features an alternate continuity where the characters naturally age after Peter Parker becomes Spider-Man in 1962. Miles Warren was ordered by Norman Osborn to create clones of Norman and Peter. In 1977, Norman convinced Harry to attack Miles after discovering that Warren had created a clone of Gwen as well. Harry deduces that Norman had Miles clone Peter because Norman still viewed Peter as a more worthy successor over him. After Peter calms him down, Harry blows up the containment tubes with the clones. Peter's clone was the only survivor thanks to inheriting Spider-Man's powers. However, Miles reveals that the "Gwen" Peter was with was actually her clone while the real Gwen died in the explosion. A year later, Peter and Gwen's clones rename themselves as Ben and Helen Parker and move out of New York for a second chance at life. When Reilly goes searching for the baby, he is attacked by the Green Goblin, who is revealed to be Harry Osborn and working with Kaine. Though Reilly appears to gain the upper hand in the ensuing fight, the Goblin impales him in the back with his glider. Miraculously, Reilly survives the attack. Osborn had been plotting his revenge against Parker since his apparent heart attack. Osborn creates a clone of his father, Norman, to help him defeat Parker and Reilly; however, Norman jumps in front of Harry's Goblin Glider as it is about to hit Parker and is impaled in the back. Afterwards, Kaine returns baby May to Parker and Mary Jane, Aunt May survives and wants to help raise the child, and Ben Reilly leaves once again to travel the world and find a life for himself. During the 2014 "Spider-Verse" storyline, Ben Reilly of Earth-94 was recruited into a team of multiverse Spider-Totems who were teaming up to fend off the Inheritors, who were trying to devour each and every Spider-Totem. In this particular universe, Peter Parker's powers did not return, with Peter remaining in Oregon while Ben has developed into a far lighter character without the burden of Peter's past, particularly aided by the string of successes he had as Spider-Man, including saving Marla Jameson from Alistair Smythe and preventing Doctor Octopus from taking his body. This version of Ben Reilly lead a team featuring fellow clones Kaine of Earth-616 and the Jessica Drew of Earth-1610 who are sent on a mission that requires their 'expertise' as clones of Spider-Man. Their mission sends them to Earth-802, a world conquered by the Inheritors and ruled over by the Inheritor Jennix, whose efforts to clone spider-totems failed to clone the spider-essence itself. Despite their best efforts to infiltrate said world, the spider clones would end up doing battle with the dimension's versions of Iron Man and the Human Torch, as well as Jennix himself, before Reilly later sacrificed himself to destroy the Inheritors' cloning facility; which they used to resurrect themselves if they fell during their trips to other worlds. An evil clone appeared in The Amazing Spider-Man 1970s television series. He was seen in the episode "Night of the Clones". Scarlet Spider made another non-voiced cameo appearance on the 1990s Fantastic Four animated series. In the episode "Nightmare in Green", his shadowed figure can be seen hanging underneath a building ledge. Scarlet Spider (Ben Reilly) made his first official appearance in Spider-Man: The Animated Series, voiced by Christopher Daniel Barnes. In an alternate reality from the main series reality, it is unknown whether Scarlet Spider is Spider-Man's clone or vice versa as Miles Warren had "robbed them of their pasts". Due to the confusion, one is Ben Reilly and adopts the Scarlet Spider alias. The other (already struggling with the idea that he might not be real) meets up with Scarlet Spider at the Kingpin's lair and the two fight. The Carnage symbiote emerges from an open inter-dimensional portal and bonds with the second one, and is driven completely insane and turns into Spider-Carnage. In the series finale where numerous versions of Spider-Man from different realities team up to stop Spider-Carnage, Scarlet Spider tells his origin to Spider-Man and remarks "This is starting to sound like a bad comic book plot!". Spider-Carnage nearly destroys the entire multiverse but the Beyonder and Madame Web are able to rewind time enough to gather Spider-Men capable of stopping this destruction with Scarlet Spider being among them. Scarlet Spider is featured in Ultimate Spider-Man vs. The Sinister Six, voiced by Scott Porter. Shown to have stingers under his arms and a personal vendetta against Doctor Octopus, this version's costume is Kaine Parker's from the original comics but has Ben Reilly's name. Scarlet Spider's personality is a mix of Kaine's aggressiveness, and Reilly's loyalty and dedication. When first introduced, he refers to himself as 'the first spider' and 'not of [this] world' as he reluctantly works in the Web Warriors alongside Spider-Man (Peter Parker), Flash Thompson as Agent Venom, Iron Spider (Amadeus Cho) and Miles Morales as Kid Arachnid. His origin and identity are deliberately left vague until his name is given to him by May Parker when unmasked and shown with a scar on his face. Scarlet Spider plays a central role in "The New Sinister 6" two-part episode. During the Sinister Six's attack on the Triskelion, it was revealed that Scarlet Spider was Doc Ock's spy in the S.H.I.E.L.D. Academy as the Sinister Seven's secret member. Scarlet Spider defeats then unmasks Peter in front of Doc Ock. It's apparently revealed that Doc Ock took Scarlet Spider in and is behind his powers. Scarlet Spider watches as Doc Ock uses the invention to turn HYDRA Island into Octopus Island. When May gets captured, Scarlet Spider is persuaded by May to help Spider-Man, thus Ben fights off his former master for Peter and May. When Octopus Island starts to implode, Ben shoots an escape pod with Spider-Man and May out of Octopus Island, and then pilots Octopus Island to crash into the harbor; Spider-Man was unable to find Scarlet Spider's body. In reality, Ben is actually alive but decide to stay in the shadows from his allies and enemies alike, yet soon becomes suspicious of his actual origin and decided to confront Doc Ock for these further information, which is later continued on "The Spider-Slayers" three-part episodes where he takes Doc Ock with him to HYDRA Island and tells Spider-Man and Spider-Woman not to follow him. He learns the truth about being a synthezoid with Spider-Man´s DNA and who is also the Spider-Slayers' leader. Following a graduation ceremony, Scarlet Spider becomes a S.H.I.E.L.D. Academy teacher in the series finale. The design for Peter Parker's original Spider-Man suit in Spider-Man: Homecoming (2017) bears a marked resemblance to Ben Reilly's original Scarlet Spider suit. Concept art by design artist Ryan Meinerding depicts an alternative version of the suit that was intended to be a representation of Scarlet Spider. In Spider-Man: Into the Spider-Verse, the appearance of Peter Parker/Spider-Man of Miles Morales' dimension of blonde hair is a homage to Ben Reily's dyed blonde hair during his run as Spider-Man. 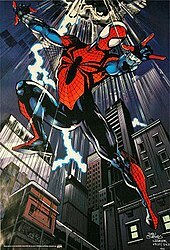 Ben Reilly's Scarlet Spider and Spider-Man costumes can be worn by Spider-Man (Peter Parker) in the 2000 Spider-Man video game and Spider-Man 2: Enter Electro. Ben Reilly's Spider-Man and Spider-Carnage costumes can be worn by Spider-Man (Peter Parker) in the Wii version of Spider-Man: Web of Shadows. Scarlet Spider's costume is one of Spider-Man's alternate costumes in Marvel: Ultimate Alliance, Spider-Man: Shattered Dimensions, Ultimate Marvel vs. Capcom 3, Spider-Man: Edge of Time, and Marvel's Spider-Man. Spider-Carnage's costume can be unlocked in The Amazing Spider-Man 2. Ben Reilly is a playable character in Marvel Super Hero Squad Online as both Scarlet Spider (voiced by Chris Cox) and Spider-Man (voiced by Yuri Lowenthal). Ben Reilly appears as a playable character in Spider-Man Unlimited as Scarlet Spider and Spider-Carnage. Scarlet Spider is a playable character in Lego Marvel Super Heroes 2. 1996: Scarlet-Spider (Ben Reilly) as an action figure by ToyBiz in the "Marvel OverPower Card Game – PowerSurge Invincibles" toyline. 1996: Spider-Man (Ben Reilly) with venom containment gear, featured as an action figure by ToyBiz. 1997: Spider-Carnage featured as an action figure by ToyBiz in the Spider-Man/Venom – Along Came a Spider toyline. 2002: Scarlet Spider (Ben Reilly) was a KB Toys exclusive in the Spider-Man Classics toyline. 2004: The Spider-Man Classics range from ToyBiz featured a Spider-Man (Ben Reilly) figure, which is slightly oversized compared to other figures in the range, is missing his wrist mounted web-shooters, and comes with a missile launching backpack. 2004: Spider-Man (Ben Reilly) featured as a Kubrick in a 5-figure Spider-Man box set released by Medicom Toy. 2005: Scarlet-Spider (Ben Reilly) featured as a Kubrick in Medicom Toy's Marvel Super-Heroes Series 4 toyline. 2005: Spider-Man (Ben Reilly) and Spider-Carnage Minimates were available in Series 10. 2007: A Scarlet Spider (Ben Reilly) Minimate was sold with Hobgoblin. 2008: Ben Reilly, in his redesigned Spider-Man costume, was featured as a figure in the Ares Build-A-Figure series of Marvel Legends. Although he is in his Spider-Man costume, his figure is labeled as "Scarlet Spider" to differentiate him from Peter Parker versions. Additionally, just one of the pictures on the package is Ben Reilly, being one art from the cover of Spider-Girl #94, and another from The Amazing Spider-Man #509. 2009/2010: Marvel's Super-Hero Squad range features both a Scarlet Spider figure (named "Ben Reilly Spider-Man" and packaged with Bullseye) and one of his re-designed Spider-Man costume (packaged both individually and with Carnage). 2016: Marvel's Marvel Legends was packaged as "Ben Reilly Spider-Man". This figure came with 4 sets of interchangeable hands, including a Spider-Carnage set and a Spider-Carnage interchangeable head. The packaging is the same as used with the Spider-Gwen action figure in the same line. The Lego set 76057 Spider-Man: Web Warriors Bridge Battle features a Scarlet Spider minifigure. ^ The actual published title is "Even if I Live, I Die!". The source gives no indication whether the title was changed prior to publication or Conway simply misremembered it. ^ a b c d e f g Veronese, Keith (October 2010). "Spider-Man: The Beginnings of the Clone Saga". Back Issue!. TwoMorrows Publishing (44): 69–77. ^ Wigler, Josh (July 25, 2010). "CCI: The Marvel: Spider-Man Panel". CBR.com. The Premium Network. Retrieved 15 May 2018. ^ Markus, Tucker Chet (July 22, 2011). "Eat the Universe with John Urschel". Marvel.com. Retrieved 15 May 2018. ^ a b Amazing Spider-Man Vol. 4 #22. Marvel Comics. ^ Amazing Spider-Man vol. 4 #2. Marvel Comics. ^ Amazing Spider-Man vol. 4 #4. Marvel Comics. ^ Amazing Spider-Man vol. 4 #10. Marvel Comics. ^ Amazing Spider-Man vol. 4 #16. Marvel Comics. ^ Amazing Spider-Man vol. 4 #19. Marvel Comics. ^ FCBD 2016 Captain America #1. Marvel Comics. ^ Amazing Spider-Man vol. 4 #17. Marvel Comics. ^ Amazing Spider-Man vol. 4 #20. Marvel Comics. ^ Clone Conspiracy #2. Marvel Comics. ^ The Clone Conspiracy #3. Marvel Comics. ^ The Clone Conspiracy #4. Marvel Comics. ^ The Clone Conspiracy #5. Marvel Comics. ^ Amazing Spider-Man Vol. 4 #24. Marvel Comics. ^ Clone Conspiracy Omega #1. Marvel Comics. ^ a b David, Peter (w), Bagley, Mark (p), Dell, John (i). Ben Reilly: The Scarlet Spider #1 (April 2017). Marvel Comics. ^ David, Peter (w), Bagley, Mark (p), Dell, John (i). Ben Reilly: The Scarlet Spider #2 (2017). Marvel Comics. ^ Peter Parker: Spider-Man #75. Marvel Comics. ^ Spider-Girl #44. Marvel Comics. ^ Darkdevil #1–3. Marvel Comics. ^ Spider-Girl #46–47. Marvel Comics. ^ Ultimate Spider-Man #61. Marvel Comics. ^ Ultimate Spider-Man #101. Marvel Comics. ^ What If? #30. Marvel Comics. ^ What If? vol. 2 #86. Marvel Comics. ^ Cite error: The named reference Spider-Man: Life Story #2 was invoked but never defined (see the help page). ^ Spider-Man: The Clone Saga #1–6. Marvel Comics. ^ Spider-Verse Team Up #1. Marvel Comics. ^ a b Scarlet Spiders #3. Marvel Comics. ^ Sunu, Steve (July 25, 2014). "SDCC EXCLUSIVE: Costa Assembles 'Scarlet Spiders' For 'Spider-Verse'". CBR.com. ^ "Spider Wars, Part One – I Really, Really Hate Clones review". Toonzone.net. Archived from the original on 20 February 2008. Retrieved 2008-02-21. ^ "Spider Wars, Part Two – Farewell Spider-Man review". Toonzone.net. Archived from the original on 20 February 2008. Retrieved 2008-02-21. ^ Peters, Megan. "Spider-Man: Homecoming Concept Art Reveals Scarlet Spider Suit Design". comicbook.com. ^ "Hobgoblin/Scarlet Spider Minimates Exclusive". OAFE.net. Archived from the original on 3 February 2009. Retrieved 2009-02-02. ^ "ML: Scarlet Spider". OAFE.net. Archived from the original on 5 February 2009. Retrieved 2009-02-02. ^ "Spider-Man™: Web Warriors Ultimate Bridge Battle - 76057 - Marvel Super Heroes - LEGO Shop". Shop.lego.com. Retrieved 8 September 2018.